Omaha has produced some important people: Warren Buffett, Marlon Brando, Malcom X, Chris Klein. But what's all this about MMA fighter Jake "The Juggernaut" Ellenberger getting a key to the city? Hold on a tick. Ellenberger is a very good fighter who's beaten a couple very good fighters and a bunch of average ones and lost to a couple pretty good fighters. He's fighting Diego Sanchez in a free UFC event on Fuel TV on Wednesday night. Fuel TV! Where are your standards, Omaha? Now, I know these keys are given out like party favors, so I'm mainly kidding. I won't even comment on the fact that it wasn't even mayor Jim Suttle who gave Ellenberger his key on the steps of the courthouse or anything. It was the mayor's deputy chief of staff at the UFC media workouts, if the photo below is any indication. Deputy chief of staff! UFC media workouts! Where are your standards, Omaha? 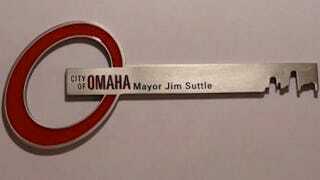 All joshing aside, let's commend Suttle not only for his futuristic key design but for honoring a MMA fighter. In this instance, Omaha makes New York City look like a backwater, where MMA still feels like something out of a Van Damme movie. No keys to the city in New York. No doctors ringside either.